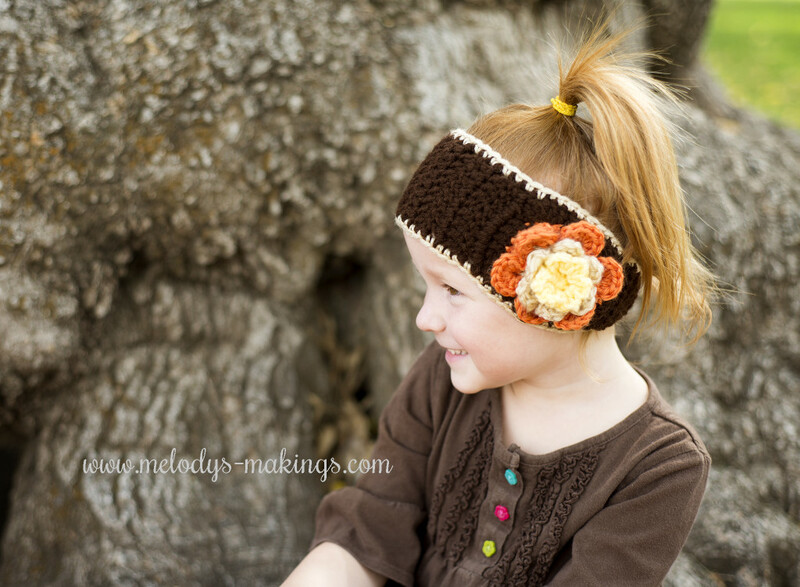 Falling Flowers Ear Warmer – Free Pattern! Falling Flowers Ear Warmer – Free Crochet Pattern! Sizes Baby, Toddler, Child, and Adult. The little girls in your life are going to LOVE this week’s free pattern! As soon as Fall hits, I start digging out my chunky sweaters, my fuzzy socks, and my pajama pants. I’m such a cold blooded creature by nature! I can’t stand to be cold though…..and, in my opinion, some of the most important body parts to keep warm are the ears. There’s simply nothing worse than a headache brought on by having cold ears! This particular design was inspired during the last Mystery Create-A-Long (in case you haven’t heard, we’ll be starting another one of these fun events soon! Check out the details and get signed up by clicking here). We started off by making a gorgeous flower square. When I asked everyone what they thought we might be making, someone guessed ear warmers! Though we were really making a dress, I just couldn’t get her guess out of mind….I had to bring it to life! Thus, the Falling Flowers Ear Warmer was created! Falling Flowers Ear Warmer – Free Knit Pattern! Sizes Baby, Toddler, Child, and Adult. 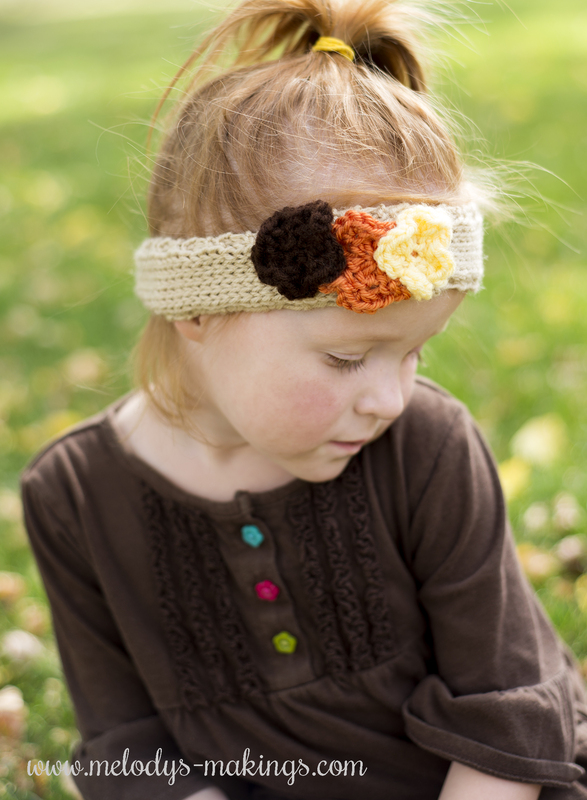 The crochet version of this cute fall pattern features two beautiful fall flower squares over the ears. The knit version is more of a band embellished with beautiful fall flowers. Both versions include sizes Baby, Toddler, Child, and Adult….so you can keep all the girly ears in your family toasty warm! Thank you for free pattern. I was looking for one like that. GRACIAS POR COMPARTIR SUS PATRONES, EN LA PROXIMA SEMANA TRATARE DE HACERLO PARA MIS NIETAS. You outdid yourself again Melody!!! I love it. I just hope I can remember how to do the flower lol! Very cute. My grandaughter will love it. Thank you for all you do and the free patterns. Another lovely pattern!!! Going to make one for me since I have no girls left at home!!!!!! Thank you for your generosity, Melody. Great pattern for this Thanksgiving Monday. Wrote you back via Facebook. 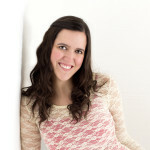 Were you ever able to see the tutorial pics I directed you to? I added this pattern to my favorites and queued it and I still can’t see it. Im technically handicapped sometimes. Thank you for the lovely ear warmer pattern.